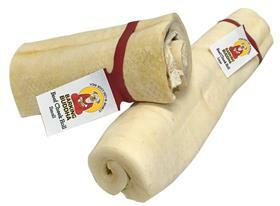 Our Large Beef Cheek Rolls are much easier to digest making them a great alternative to rawhide. They are rich in collagen, and full of delicious flavor. They are additive free, chemical free and preservative free. Great for small to medium dogs! Our custom-made human-grade ovens allow for our Beef Cheeks Rolls to preserve their natural beef flavor and a more natural color.